The impact of former judge Roy Moore’s landslide win in Alabama’s Republican Senate primary extends beyond that seat or this week’s tally of political “winners and losers.” A closer look at the election results suggests the fallout may extend into 2018 and a more fundamental remaking of the Senate GOP caucus. The Alabama primary results show a pattern that could cause concern for GOP establishment candidates in certain kinds of states — those with lower percentages of college graduates. 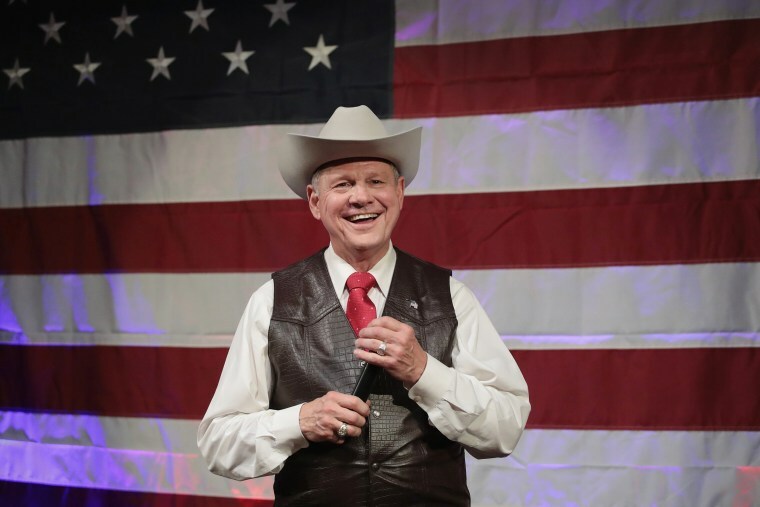 Much has been made of the scale of Moore’s win and it was remarkable, a nearly 10-point win over a sitting senator, 54.6 percent to 45.4 percent. Incumbent Luther Strange only won 4 of the state’s 67 counties. But breaking down the results at the county level with college education rates reveals some dramatic differences in the numbers. There are five counties in the state of Alabama where more than 30 percent of the 25-and-over population has a college degree, according to the U.S. Census. Strange won three of those counties and did so fairly convincingly, by about 8 points, 54.1 percent - 45.9 percent. But the rest of state went against the sitting senator and the margins for him got worse as the percentage of those with a college education dropped. There are two counties where the college education rates were between 25 percent and 30 percent. Moore won those counties by about 6 points, 53.2 percent – 46.8 percent. The rest of the counties have fewer than 25 percent of the population with a degree. Moore won them by more than 18 points, 59.2 percent – 40.8 percent. Those education numbers have a special significance when you look at the Republican Senate seats that are up in 2018. In eight of them, all but Utah, the college-educated population numbers are below 30 percent, which is roughly the national average. The Alabama results suggest the Republican voters in those states may be ready for a more populist, anti-establishment candidate — one that would challenge the incumbent and pull him or her toward the more populist end of the GOP. To be clear, these college education figures aren’t solely about education, they are about people living in different economic and cultural worlds. The national unemployment rate was 4.4 percent in September. But for those with just a high school degree, it was 5.1 percent. For those with a college degree it was only 2.4 percent. The median weekly earnings for those whose highest educational attainment is high school diploma was $692 in 2016. For those with a bachelor’s degree it was $1,156. Those with a professional degree earned $1,745 weekly. And along with those economic splits, the urban/rural divide is increasingly tied to the numbers for education. In most of the states above, the Republican nominee, whoever it is, is likely to prevail. The vote coming out of them is consistently solidly Republican. But the question is what kind of Republican. Moore’s win in Alabama may be a sign that, in some states, the Republican establishment is getting ready to face stiff headwinds in 2018. Those headwinds have the potential to change the politics of the next Republican majority in the upper chamber of Congress. In some states, the populist momentum could impact whether the Republican majority survives. In Arizona and Nevada analysts were already predicting tough fights for the Republican candidates. More hardline populist candidates could hurt the party’s chances in the general election in them because the partisan divide with the full electorate is much closer. And there are several Senate seats currently held by Democrats in the industrial Midwest such as Michigan, Indiana, Ohio, Pennsylvania and Wisconsin, where the impact of a populist Republican candidate is unclear. In all those states, fewer than 30 percent of the population has less than college degree. In West Virginia, where Democratic Sen. Joe Manchin is up for reelection, 19.2 percent have a college degree. The 2018 midterms are still a long way off. The issue terrain and President Donald Trump’s standing with the voters could look very different 13 months from now. But Roy Moore’s nomination in Alabama and the way the primary vote out of the state broke down suggests that the Republican Party may be headed for a divided and bumpy midterm as the GOP tries to find its identity in the era of Trump.